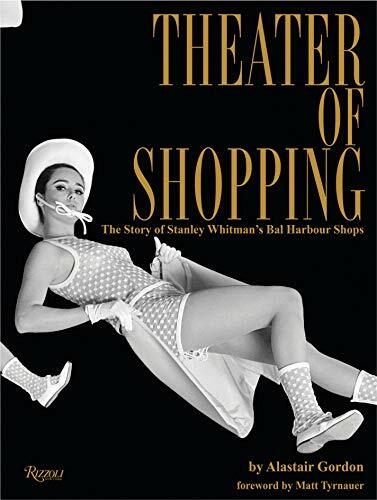 Theater of Shopping is a mix of a chronicle and history of the development of the Miami area, Bal Harbour, and the biography of Stanley Whitman and his vision. Alastair Gordon profiles the Whitman family as prewar millionaires, but Mr. Whitman was to step far afield of the family business to pursue his vision and his dream. A. Alfred Taubman may have envisioned the earliest of indoor shopping malls, but it was Whitman in the mid-’60s who took the concept of a shopping mall to far loftier levels. If you have never experienced the Bal Harbour Shops then you have missed one of the great shopping experiences. Mr. Whitman had a far more exotic plan for what a shopping mall should be in comparison to Mr. Taubman, who is often referred to as “The King of Shopping Malls.” The two could not have been any more divergent in their concepts given their backgrounds and their individual ideas for what a mall should and could be. It is no mystery then that Mr. Taubman is not even mentioned in this book. Theater of Shopping is an examination of Stanley Whitman who might have been considered obsessive in his quest to make his dream come true. He was nothing short of surgically thorough when it came to the smallest aspects of what he wanted and how he envisioned Bal Harbour. He was a visionary whose dream has withstood the test of time given the ongoing incredible success of the Bal Harbour shops. Prospective readers should have a keen interest in all aspects of fashion, ranging from architecture to fashion trends to décor to a shopper’s mentality and even to real estate development. Theater of Shopping is a stand-alone dissection of the psyche of shopping, the esthetics, the tenancy of the center, and a man who was way ahead of his time. The book is fascinating and at times a bit pedantic but Gordon had every intention of telling Mr. Whitman’s story in its entirety, which is a rarity since few books detail how it all started and not just the end result.